When it was first founded, the Southern Poverty Law Center (SPLC) was a legitimate organization devoted to opposing actual hate groups such as the Ku Klux Klan. Even today, the SPLC describes itself as an organization “dedicated to fighting hate and bigotry and to seeking justice for the most vulnerable members of our society.” However, in reality, the SPLC has turned instead to slandering and demonizing Christian and conservative organizations, labelling them “hate groups.” These groups are placed in the same category as the KKK on the SLPC’s “hate map” for merely upholding traditional standards of marriage and sexual morality. 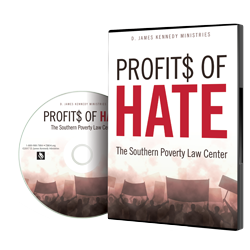 In the Profits of Hate: The Southern Poverty Law Center DVD, we reveal the true motives of the liberal-progressive SPLC. Their deceptive “hate map” attempts to demonize and silence Christians—and makes huge profits for them in the process. As the DVD shows, when disagreement with radical liberalism is labelled “hate,” the consequences can be dire and even tragic. A shocking and tragic video of an attack perpetrated in the name of the SPLC. This DVD will ship in mid-July, once the program has aired. We’re offering it to you as thanks for your generous donation of $25 or more. Your support is invaluable to us as we seek to provide resources to teach and nurture the followers of Christ and empower them with the tools they need to face today’s critical issues.